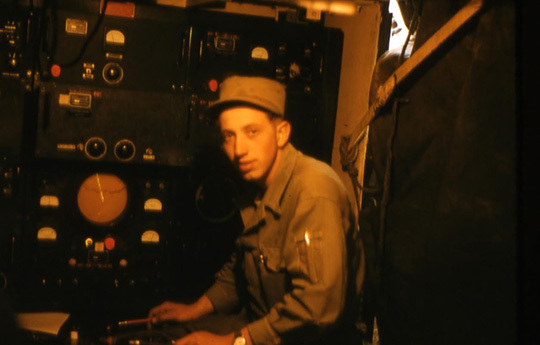 My Dad, PFC Sternberg, operating a radar unit during the Korean War. While I personally have never served in the armed forces, most of my friends had at one point in time or another. James, one of my childhood friends, later went on to graduate from the prestigious National War College. In my 20’s, one of my closest friends, Rob, was an ex-Marine. When I went to UNLV, a good friend of mine used to take me up in private planes while he was logging solo flight hours for his admission into the U.S. Navy. He later went on to graduate Top Gun and is currently still an F/A-18 Pilot. Today, most of my friends are either veterans or retired U.S. Military, serving our nation in careers ranging from flight squadron commanders to my friend Dee, military police officer. I have always had the utmost respect for those who give so generously for the defense of our great nation. This got me to thinking several months ago about doing something to support our troops. 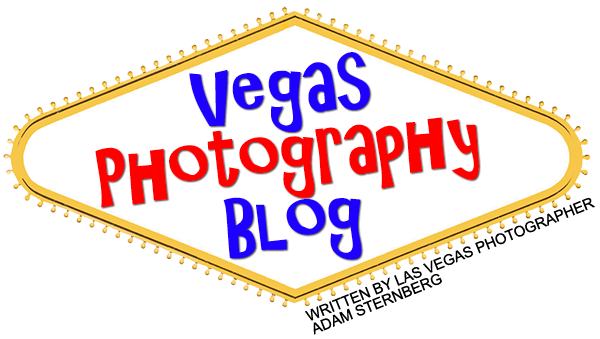 I was doing a photo shoot with my friend Samantha, who I wrote about in a previous blog about the photos we got published in MyVegas Magazine. 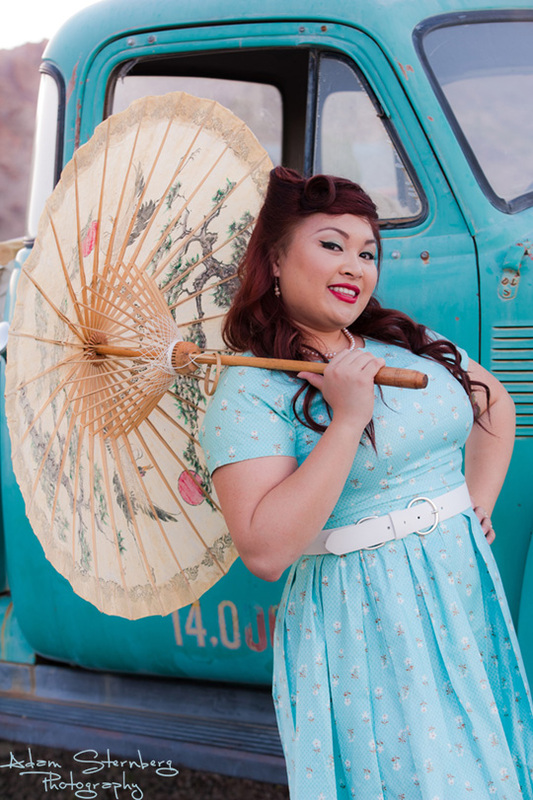 Prior to our shoot with her breathing fire at the Downtown Container Park, she and I worked on a cool pin up photo shoot, which has since been published in Fashion Bombshell Magazine. I really enjoyed doing a classic pin up shoot a lot, and I spent a lot of time researching the many different styles of pin up art and photography that has spanned many decades and trends, and after that shoot I really wanted to explore doing more creative styles of work in this genre even more. That’s when it hit me. 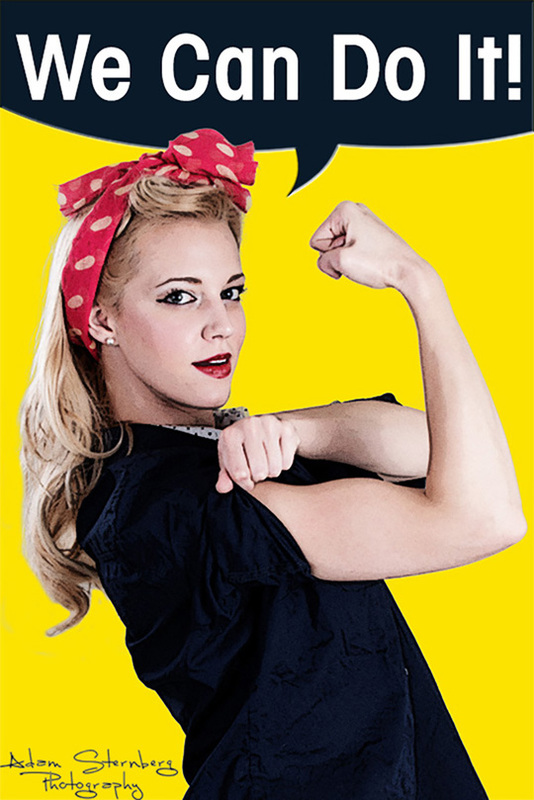 Being that pin up art is very deeply rooted in military culture, from tattoos soldiers would get while stationed overseas to the images pilots would paint on the sides their bombers, why not do a pin up calendar for charity as a way to support our troops?! I contacted a number of different charities to get some opinions on how I could support them with this type of project and the answer I kept hearing was, “Once you have produced the calendar, we will have our legal teams review the photos and get back to you.” OK, so I had to make the calendar first and then figure out who I was going to help with it later. No problemo! 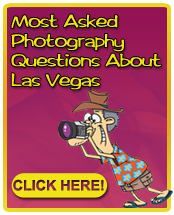 The first thing I did was run casting calls all over the Internet looking for pin up models. I started doing this over the past summer, figuring it was going to take some time to do the shoots, handle the retouching and design work, assemble the calendar, etc. 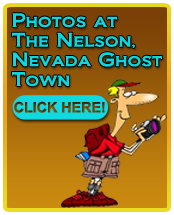 Two photos I wanted to use were already shot though. A few years ago I did a shoot for a client, Sigrid, for her and her brother. 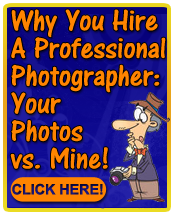 I emailed her and asked if I could use one of the photos for this project and she happily agreed. Another photo I shot of my friend Mariah. Having moved to Denver over a year ago, her and her husband were some of my go-to models whenever I needed fun, creative types to work with. Robert, her husband, is an ex-marine, so I emailed the two of them and asked if I could use one of the photos I shot of Mariah and they loved the idea. (Mariah and Robert were my “Joker” and “Batgirl” as featured in a previous blog from 2011). Some models I wanted to use I already knew though, such as my friend Lisa, and of course she referred me to another model, Dahlia, who was just a HUGE help on this project. Not only is Dahlia a professional pin up model but she really does live the lifestyle. Her entire wardrobe is made of vintage, 1930s and 1940s style clothing. Sarah, a regular in my blog, was a given…nobody I’ve ever worked with puts in as much effort to making a shoot perfect as she does. With her unique creativity, I KNEW I had to get her involved. I had a few shoot ideas in mind but a lot of the concepts were created as we were shooting on set. Some were shot on location, others in studio. This is a before and after photo of the shoot I did with model Sarah Jane Woodall. We didn’t have a feather duster so she used a makeup brush as a reference mark. All the other components were added in post. One thing I truly did not expect were the emails and calls of support from people wanting to help out on this project once they heard what it was for. Bill, a local firefighter emailed me and asked if I would like to use his 1950 fire engine for the shoot. Once I saw the photos of this fully restored beauty I just knew I had to use it for something and it is now the background for our August photo with the awesome local model Kalliann Haas, who I wrote about in a previous blog where we shot all around Lake Mead. A car aficionado, I love to go to local car shows and there are some classic car collectors who do meet-and-greets in my neighborhood every Sunday. While perusing through these gorgeous automobiles of yesteryear, I fell in love with this one white car, a 1937 Ford coupe. WOW was this car beautiful. I spoke with the owner, a military veteran, and told him my desire to use the car for a photo shoot and he was thrilled. So thank you VERY much David for the use of your vehicle…it is now on the cover of our calendar and also featured for September! After many months of photo shoots and hours and hours of retouching and graphic work, the calendar was now ready. Now the question came into my mind of who would be a great charity to work with on this. There really are many wonderful organizations out there and many were recommended to me but one stood out more than any other, and that is the USO. After all, who would be able to identify more with this kind of thing than the USO?! The USO (United Service Organizations) was founded in 1941 as a non-profit organization to provide morale and recreational service to members of the U.S. military. 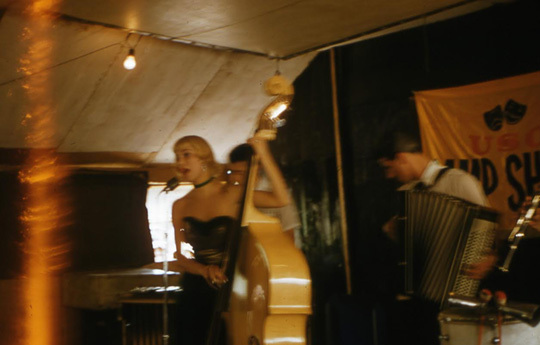 The USO is best known for their live performances for troops around the world by such notable entertainers as Bob Hope, Judy Garland, Robin Williams, Lucille Ball, Lewis Black, Marilyn Monroe, Mark Wahlberg, and many others. But more importantly, they provide over 160 different locations around the world for military personnel and their families to visit for recreational down-time. They also aid in the transportation of fallen soldiers and comfort for families in dealing with such losses. Their airport lounges provide books, televisions, free snacks, and even quiet, comfort areas for soldiers to take a nap and relax before their flights. 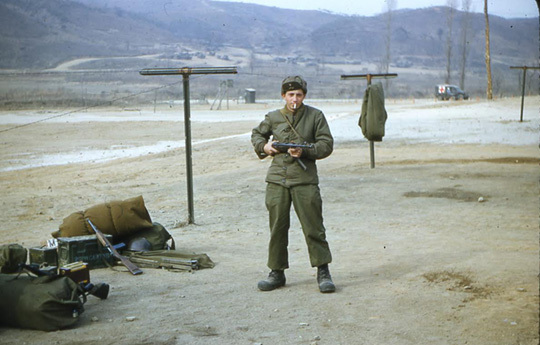 The USO visiting my father’s unit during the Korean War. Staff member Tim Mullin (right) and the one of over 100 active volunteers at the USO Las Vegas greet soldiers and their families inside McCarran Airport. They have two locations in the airport, one on the second floor overlooking the Ticketing area and the other in the new Terminal 3 area. 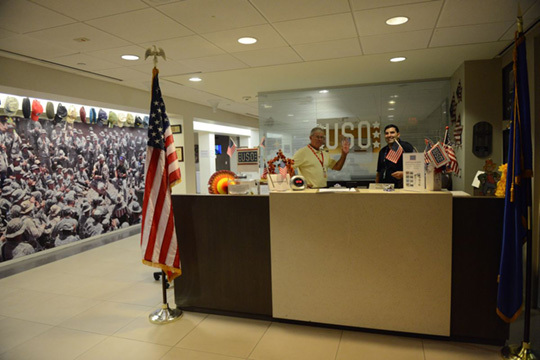 The USO Las Vegas provides a variety of services for active duty military and veterans. Some of these free services include access to computers so they can send emails, print out boarding passes, and even borrow mobile phones to call loved ones while they are passing through. 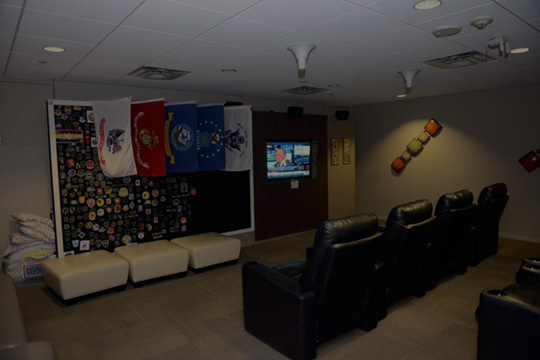 Whether you want to watch a movie or relax in a comfy recliner and get some rest between flights, the USO Las Vegas provides these services for our military. 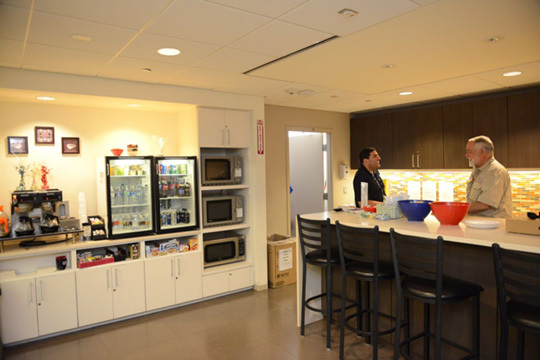 Drinks and snacks are generously donated to the USO Las Vegas by HMS Host, one of the primary food service companies in the Las Vegas airport. Other items are donated by fliers who are unable to take food items through security. It’s an awesome program that is a huge morale booster for our military members traveling abroad! After meeting with the staff of the USO and some of their amazing volunteers, I knew this was the right choice for this project. So, effective November 25th, our 2015 calendar is complete and is now for sale! This is a large, 11X17” calendar printed on high-quality stock to showcase the awesome pin up beauties! 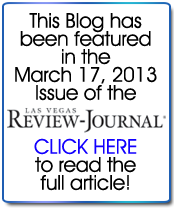 You can get your copy for only $24.95 (plus shipping) and 100% of the profits will be donated to the USO Las Vegas. 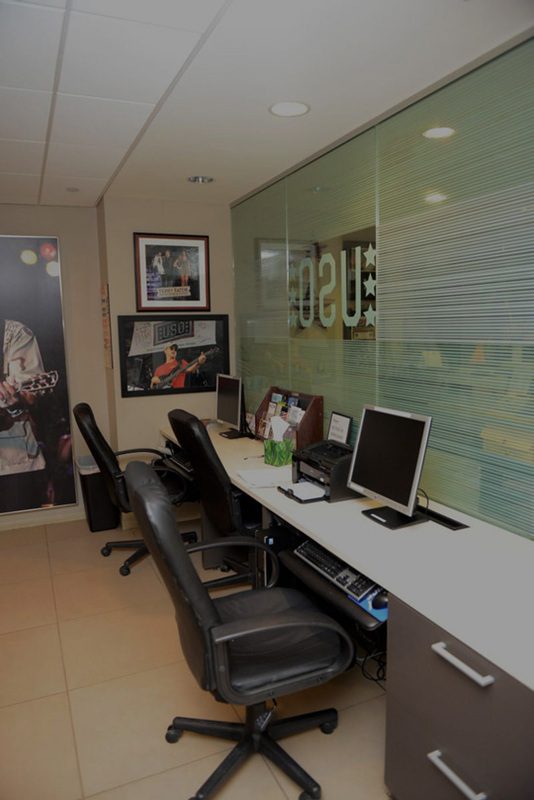 In 2013 the USO Las Vegas was awarded as being the top USO facility out of their 160 locations around the world and they hope to receive the same award for 2014, so you know that your contribution to this project is a great one. MANY special thanks to the amazing models who donated their time, energy, and talents to making this project come together: Amy, Agatha, Dahlia, Kalliann, Lisa, Maria, Samantha, and Sigrid. I couldn’t have done it without you guys. Special thanks to the rest of my team from our photo assistants, makup artists, and to our classic vehicle owners as well. These 2015 calendars will be on sale only for a few more weeks so to get your calendar, especially in time for Christmas, please order now before they are all gone!